This Cézanne can barely hold it together - the rim of the white jar dithers off into space, the lines of the gray urn are uneven, and the table doesn't even have an even corner. There are so many imperfections, yet Cézanne pulls it all together when we notice the translucency of the nectarine in the middle of the painting. It's almost as if Cézanne didn't care about anything else and he just wanted to get one thing right in the painting - the bursting, feathery aspect of the fruit, and that was good enough. Above: the best Gauguin I've ever seen. This painting happens at no one's expense - it's not a voyeuristic ogling of an underage island native or an overmasculine achievement portrait. The painting contains a sense of humanity and family, yet not in a grandiose sense. It isn't even trying to impress us in the way a still life impresses us. Maybe this is what makes the figure in the grass and the three children so relatable. They could be almost anyone, or all of us. The world is bigger than we are. These large water lily paintings look a like a struggle to paint, when viewed at an arm's length. 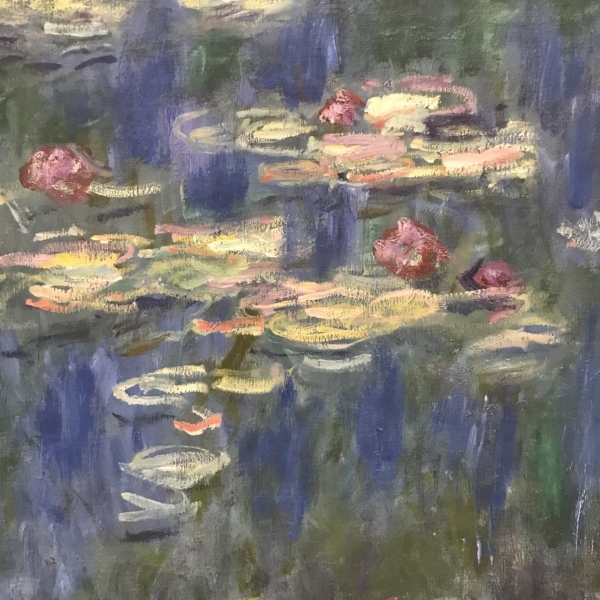 The scraped brushstrokes feel dry and urgent, yet the lillies as a whole float placidly, without a care, a cloud slowly crossing the screen of the pond. Even the calmest world, when seen up close, descends into utter chaos.